On January 10 of this new year, three organizations and three individual plaintiffs in Wisconsin sued the state’s Elections Commission’s individual members and interim administrator, and the newly installed Democratic governor, Tony Evers (apparently as a necessary party). The target of the lawsuit is legislation passed - and 82 state-office appointments confirmed - by the Republican-majority state legislature, largely on party lines, in a lame-duck session in December, shortly after voters elected Democrats as governor, attorney general, and treasurer. The organizational plaintiffs are the League of Women Voters of Wisconsin (LWVW), Disability Rights Wisconsin (DRW), and Black Leaders Organizing for Communities (BLOC). The individual plaintiffs are an employee of a woman-owned business and two other taxpayers who spent the largest parts of their careers as state-government lawyers, for, respectively, the Wisconsin Department of Natural Resources and the Wisconsin Attorney General. The LWVW summarizes the lawsuit: “The plaintiffs allege that the Legislature unconstitutionally convened an ‘extraordinary session’ during which it passed three bills that expand the Legislature’s powers at the expense of the executive branch of government, thereby causing the plaintiffs irreparable harm.” The plaintiffs contend that the legislation at issue, inter alia, reduces the powers of the newly elected governor and attorney general, hamstrings state agencies, reduces opportunities for early voting, and reinforces voter ID requirements. The complaint is here. The memorandum in support of the plaintiffs’ request for a temporary injunction is here. 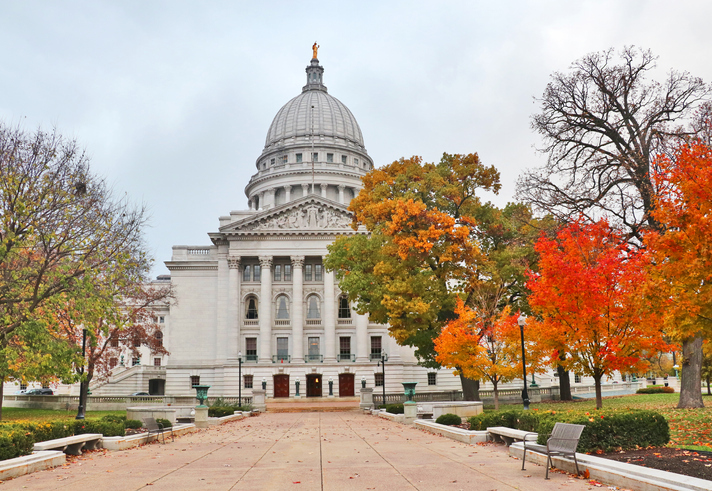 Shortly after a statewide election in which Wisconsin voters elected new candidates to replace incumbent-candidates for the statewide offices of Governor, Attorney General, and Treasurer, the Legislature, acting at the direction of the Assembly Committee on Assembly Organization and the Senate Committee on Senate Organization (“Organizing Committees”), convened the December 2018 Extraordinary Session to consider proposals limiting the powers of the Governor- and Attorney General-elect. ...the Constitution authorizes the Legislature “to meet” in only two circumstances: “at such time as shall be provided by law” and when “convened by the governor in a special session.” Art. IV, § 11. Because the December 2018 Extraordinary Session does not fall within either category, the Legislature exceeded its constitutional authority by convening the session. Thus, it follows that all legislative business conducted during the December 2018 Extraordinary Session is ultra vires and, therefore, unenforceable. In short, this is a threshold-illegality argument: no matter the content of the lame-duck litigation, it is void ab initio by virtue of the process that produced it. The lawsuit seeks two forms of relief from these actions: (1) a declaratory judgment that the statutory amendments and confirmations are “without legal effect” and (2) an injunction to bar application, implementation, or enforcement of the lame-duck legislation and confirmations of nominees. The plaintiffs’ legislative-process argument seems to be supported by provisions of Wisconsin’s constitution that govern meetings of the legislature. So, if plaintiffs have the law right and establish that the legislative session was not convened pursuant to law or convened by the governor as a special/extraordinary session, then the legislative action would appear to be ultra vires. First, whether plaintiffs ultimately prevail or lose in the state supreme court on the process issue, they could settle this legal question for all other legislation enacted in lame-duck sessions by a Wisconsin legislature. Second, if plaintiffs lose, they will be stuck with the content of the laws unless they can find other legal bases on which to challenge their substantive provisions. If they lose on the threshold issue but are permitted to amend their complaint, they will have to flesh out further the harms of the legislation in terms of other legal defects. They already do that to an extent in the complaint by setting out injuries each plaintiff will suffer from the legislation, but this seems a harder, more fact-intensive path to success. Third, if plaintiffs lose on the process issue, statewide elected officers with few or no constitutionally defined specific powers thus could become - upon assuming office - puppets of hostile lame-duck legislatures. As to the last point, this is a potential outcome of the Wisconsin litigation: for example, the powers-and-duties provision of the Wisconsin constitution for the treasurer and attorney general appears to assign to the legislature all authority to delineate this officer’s duties. Treasurer and attorney general; duties, compensation. SECTION 3. The powers, duties and compensation of the treasurer and attorney general shall be prescribed by law. For further discussion, two features of the lawsuit are significantly noteworthy: (1) it was filed in state court (in Dane County, where Madison, the state capitol, is located), and (2) the suit is entirely and only premised on state-constitutional grounds. Plaintiffs eschewed filing in federal court or including any claim sounding in federal constitutional or statutory law, such as § 1983 of the U.S. Civil Rights of 1871 (42 U.S.C. § 1983) or the Americans With Disabilities Act, which might offer a statutory basis for claims by the DRW on behalf of its stakeholders, who claim harm, inter alia, from lame-duck legislative changes affecting Medicaid in Wisconsin. The Wisconsin plaintiffs’ choice of forum and legal premises echoes the decision by voting-rights advocates in Pennsylvania in 2017 to litigate in state court - and only on state-law grounds - Republican-led legislative gerrymandering of Pennsylvania's congressional districts. The Pennsylvania plaintiffs’ decision to litigate in state court on state law was empirically defensible. Even though lower federal courts have rejected partisan gerrymandering, the U.S. Supreme Court has never invalidated a legislative districting scheme solely on the partisan advantage or disadvantage ensuing from the districting plan. The Pennsylvania case played out well for the plaintiffs. Eventually, the case reached the Pennsylvania supreme court, which ruled for the plaintiffs. And, for want of agreement between the governor and the state legislature on a replacement districting map, the state supreme court re-drew the state’s congressional boundaries, aligning them more with Democratic preferences. The U.S. Supreme Court declined to take the case. The state-court path might work out just as well for the Wisconsin plaintiffs. Optimism about state-based civil-rights litigation ought to be tempered, however, by matters relevant wherever civil-rights/civil-liberties plaintiffs consider whether to pursue state court litigation because they’re wary of winding up in a rightward-tilting U.S. Supreme Court. First, in a given state, are there state-constitutional and -statutory provisions that civil-rights plaintiffs can deploy in litigation grounded only in state law? This kind of litigation is going to be very state-specific. State constitutions and statutes vary substantially, and the facts grounding claim(s) based in state-law will be state-specific. Second, does the state supreme court lean in any particular partisan direction, and, if it does lean, which way is it moving while the litigation progresses? Realistically, the composite political bias of elected state supreme courts is likely to be an important tactical consideration for civil-rights plaintiffs who want to avoid a U.S. Supreme Court that has become less receptive during the Trump administration to civil-rights claims. The Pennsylvania gerrymandering plaintiffs eventually arrived in a state supreme court with a 5-2 Democratic majority. If not actually partisan in judicial decision-making, it’s not unreasonable to assume that the Pennsylvania court was more favorably disposed to Democratically aligned civil-rights plaintiffs than might be a Republican-dominated court. In contrast, in Wisconsin, even though the Wisconsin supreme court’s justices are elected on “non-partisan” ballots, the court apparently has a 4-3 conservative majority. Perhaps plaintiffs are betting that the state supreme court will be more receptive to their claims when their case actually reaches it. One Wisconsin supreme court seat is at play in an April 2019 election; one of the candidates is endorsed by Republicans and was formerly chief legal counsel to Governor Scott Walker, the other is endorsed by Democrats. In the last court election in April 2018, a Democratic-aligned candidate prevailed by a 56-44 majority. The best case for the Wisconsin plaintiffs after the April 2019 election thus would seem to be a politically middle-ish state supreme court. The court, however, might be more actively hostile to the plaintiffs’ claims, politically speaking, if the Republican-supported candidate prevails. Even if the candidate aligned with Democratic constituencies wins, the court will still be more conservative than not. Third, are progressive voters in a given state vigorously engaged with the state’s judicial-selection and legislative-election processes? Whether a state-court judiciary is elected or appointed, this kind of state-based civil rights litigation can only succeed where the courts are receptive to state-law civil rights claims. Long before any specific civil-rights complaint is filed in state court on state-law grounds, civil-rights stakeholders must engage actively in state judicial selection. Regardless, sore-loser lame-duck legislation might best be prevented by electing legislative majorities that won’t enact it. Over the recent history of the U.S., litigation in federal courts has been an effective tool for expanding and insuring civil rights. Opposing that trend, the anti-regulatory and theocratically inclined blocs of the Republican coalition mobilized effectively in the last 30-plus years to gain the upper hand in the federal courts and - perhaps more importantly - many state legislatures, pulling rightward state and federal legislative and judicial decision-making. Progressives have only recently taken on this same task with notable vigor. Notwithstanding recent victories (at the state level and Congressional level in 2017 and 2018), it’s going to be a long, slow climb to break the conservative grip on federal and state lawmaking processes. The state-court litigation in Wisconsin is an exemplar of one element of a comprehensive progressive legal and political strategy. And the Wisconsin plaintiffs might prevail. While promising, however, state-court litigation won’t succeed everywhere. A progressive legal agenda grounded in state-level policy-making might benefit more substantially - and more durably - from robust public involvement with state legislative elections and judicial selection.